I had previously discussed the issues with fare price protection for both consumers and brands. I outlined how fares have been priced so competitively that they rival genuine mistake fares and that the need for legislation protecting both is an immediate concern. Air New Zealand just made my case. On the day of a post I released regarding the CFR 399.88 consumer protection rule from the DoT, Air New Zealand offered business class roundtrips from Sydney to Los Angeles for just under $1000 roundtrip. They have recently announced they will “not honor” those tickets. From the time of the first post I saw regarding the sub $1000 tickets it took nearly 48 hours for the brand to decide they would not honor the exceptional deals. Gary Leff pointed out in his post on the matter that the airline was advertising great deals to Australia around the same time. While several other blogs (linked above) covered the original sale of the tickets and the cancellation, I found it precarious that there was never a statement listed from Air New Zealand from their press department on their own website. For those that will state that fares of this kind of course are mistakes and of course will not be honored I think they could have made a statement. One might think that the airline cancelling hundreds if not thousands of business class tickets would be at least as important to list as a new language availability of Moana on their aircraft which did make the press release list. While sub $1000 roundtrip tickets from Sydney to LAX are cheap, certainly, it’s not an obvious error. Let me explain that by giving some alternative market examples. Qatar recently sold tickets in business class from Vietnam to the US for around $1500 on the same day they had a fare sale planned for “golden tickets”. They later claimed that these were an error but the tickets would be honored. I’m not so sure. I previously booked a non-promoted fare sale (it was not a mistake) for $1474 from Bangkok to Los Angeles via Doha in business class. These were more expensive prices and some of the routes much shorter distances (east coast destinations were more than 5,000 miles shorter than west coast). You can see why I recently wrote that we need more clarity on mistake fare rules when more expensive tickets are mistakes and cheaper tickets are correctly priced promotional fares. These fares weren’t $450 fares in business class from Washington DC to Beijing. They weren’t $5 tickets from Hawaii, these tickets were within 40% of recent market rates. 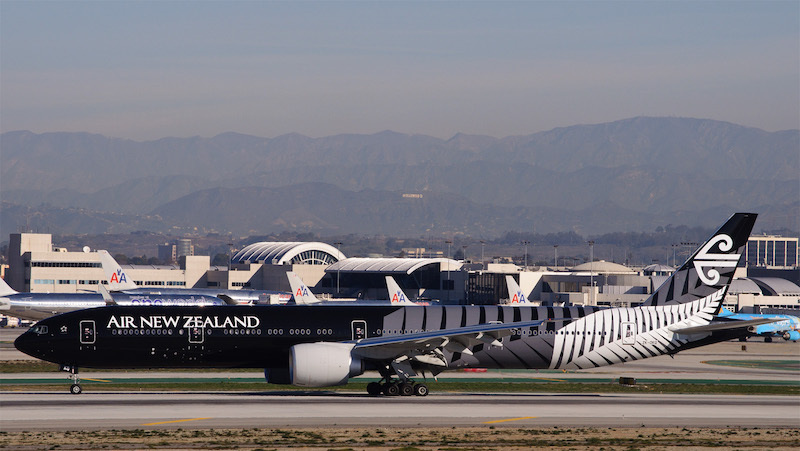 There has also been a great deal of additional competition into the market place over the last few years, it’s possible that Air New Zealand was simply ready to recapture some of that share. When looking at amazing deals (but not mistakes) these “mistake” prices were actually well within range. What about coach tickets using similar metrics? Let’s give Air New Zealand the benefit of the doubt that this was a genuine error – everyone makes mistakes, some are costly some are not. The one thing I commend Air New Zealand on in this process is that they declared within 48 hours of the ticket sales beginning that they would not honor the tickets. Air New Zealand didn’t wait around to calculate the extent of their exposure, whether or not it was a sale or mis-priced item. They simply cancelled. He underlines my point. Consumers in the US have 24 hours to fix any errors and refund the ticket purchase in full as long as those tickets are booked more than seven days in advance. Carriers are not held to the same standard. I booked a cheap fare a couple of weeks ago that I trust will be honored but really don’t know. While 48 hours is fast for airlines, consumers don’t have the same flexibility – there is a hard and fast deadline and carriers won’t let customers off the 24-hour hook, why don’t those carriers do the same? The case I’ve been making is that mistake fares and sale fares are nearly indiscernible and without clear rules in place consumers do not know if the price offered will be honored. Brands have a blank check to publish fares they never intend to honor and as good as legitimate deals have been – it’s impossible to know what is valid and what is not, and no timeline to determine such. When I first saw the Air New Zealand fares, we gave the deal a pass because we didn’t want to position to Australia and the deal wasn’t that great. Somehow it seems both funny and frustrating that fares are so cheap that even sub $1,000 didn’t seem worth booking it immediately, and that I didn’t want to mess with whether or not they would be honored. What do you think? Does the Air New Zealand mistake fare cancellation of legitimately priced tickets make my case stronger? Or am I just crazy? As I noted on my post on the fare, Air New Zealand was advertising a sale on their Australia routes at the time as well. Gary, I had missed that in the mess. Thanks for pointing me in that direction, I added a link in the second paragraph to your post so readers can see that. Thanks! If it is a mistake airfare the ethical standard should be to single the individual or contractor responsible and demand payment to compensate the airline for stipulated losses. There’s not such animal of not being responsible for job performance. As opposed to being punitive to the errant employee, I think they should just be on the hook for mistakes as other brands are. It’s a riduclous standard that consumers have very specific rules but airlines can do whatever they want. Allow consumers who feel they have been screwed to sue in small claims court. It will be easier for airlines to honor their contracts vs defend hundreds of actions. I wonder if there is a lawyer in the crowd that could draft a step-by-step guide (file this, write this) etc. and take an airline to court hundreds of times in every state – I think you’re right – it would be cheaper for them just to honor their mistake fares. And far easier. Thanks for the shout out. The devil’s advocate argument is that it’s not exactly an apples-to-apples comparison when looking at a ULCC vs. a full-service carrier, or with fares originating in one market vs. another. But my opinion still stands. The equitable solution is to hold both consumers and the airlines to the same objective standard. If fares becomes nonrefundable to consumers after 24 hours, then the airlines shouldn’t be able to claim “mistake” after the same period, either. If the airlines want to argue that they need a week to determine if something represents a “mistake” or not, fine. Then I should also have the right to claim I made a “mistake” when booking and ask for a full refund within a week, too. We agree that it should be the same rule for consumer mistakes as for industry. On the comparison flights, I thought at first that in some regards discount carriers shouldn’t be compared to full service. But then I started comparing benefits and broke it down further and relented (and this is why I included them). United/American/Delta basic economy flights are in no way different than discounters, so comparing a United deal in basic economy to a Norwegian deal really is apple-to-apples. But even regular economy flights might not hold advantages over discounters. For example, British Airways is charging for drinks in the back (Gary Leff posted about how they were charging for hot water). On some economy fares, the deepest discounts most closely compared in price to a WOW Air! for example wouldn’t earn miles and checked bags may cost nearly the same, though I have seen Spirit flights that charge less than American in the US. The real trouble for me is that the valid fares and indiscernible from the invalid ones and the consumer has no idea whether they booked a fair deal, a great, deal or a mistake and the airline has carte blanche to determine such on a timeline of their own choosing – consumers do not. Can’t you bring this up to these mega news outlets and make it a national argument? People pay attention to Time and Washington post. Of course, Reuters and HP are major in EU. good it is covered. are you chris elliott?? Certainly not, but I was quoted in the piece. I respect him and his work though we sometimes differ on aspects of loyalty programs. For Australian based customers, there is no 24 hour cancellation period for non-refundable / non-cancellable tickets. Hence for the smallest of mistakes (name typos or date errors), consumers will have to wear the entire ticket price. But Air NZ seems to think they can make a mistake and cancel after 48 hours (this ‘right’ is not mentioned in their conditions of carriage). The [unenforced] rule governing travel to the US would in theory protect any ticketed passengers that purchased qualifying ticket. That would include Aussies because the rule would force the airline to protect all purchasers – but the DoT doesn’t want to enforce or amend their own rule so we have nothing. As someone that lives in Sydney I can tell you that this is obviously an error. I have never seen any business class flights on these routes for $1,000 return, even for one stop options via NZ. They are at least 4-5 times that if not more. Premium cabins are regularly full between Australia/ NZ & North America, hence why the airlines are very stingy at releasing award seats in premium cabins. With mistake fares, sometimes you win and sometimes you lose. I think Air NZ actually did the right thing here by cancelling the tickets so quickly. Ivan, I did some looking and I could find fare sales that get down to the $2k range, and right now, normal prices according to Google Flights can get as low as 3x this deal. So yes it was very inexpensive but I would counter that other unimaginably cheap deals have gone out recently on traditionally more expensive routes. For example, if we forget about the Qatar flights for a moment (because of the subsidy question/issue) you can still point to legitimate sub $1000 fares from London to New York on BA – and while the trip is shorter, the route is far busier and more premium than SYD-LAX. Routinely, North America – Beijing in business can be had for less than $1500 which two years ago would have been preposterous. Since that time period flights to and from Australia/NZ to the US has increased dramatically with UA, AA adding flights and routes. It would make sense to me that perhaps they needed to recapture that marketshare they have lost over the last couple of years. This also happened right around the same time UA announced flights from Houston to Sydney and during an advertised Australian sale by NZ (per Gary Leff). So I don’t think it is impossible to surmise that this is a great deal, but perhaps not entirely unbelievable. I do agree that they did the right thing by coming out against it so fast, but I reiterate, if consumers are expected to realize their mistakes on a reservation within 24 hours, why can’t carriers be held to the same?